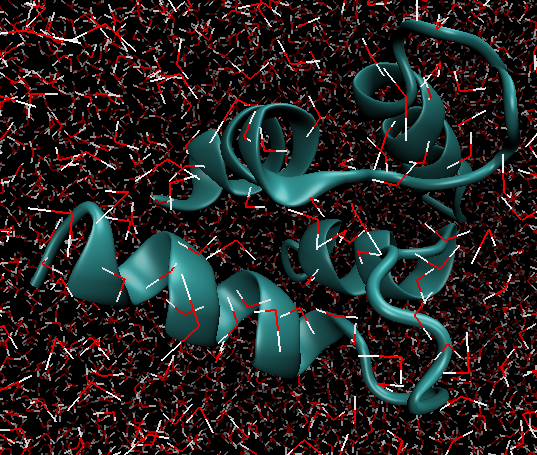 GROMACS is a molecular dynamics simulation program. In this tutorial, we learn how to run GROMACS simulations on the OSG. Our example system is a 1CTA protein dimer in implicit water. It is easiest to start with the tutorial command. In the command prompt, type $ tutorial gromacs # Copies input and script files to the directory tutorial-gromacs. Here, gromacs_job.submit is the job submission file, gromacs_job.sh is the job execution shell script and 1cta_nvt.tpr is the GROMACS input binary file. To find out how to prepare the GROMACS input file from the input strucure, check the GROMACS tutorials. Universe = vanilla                                             # One OSG Connect vanilla, the prefered job universe is "vanilla"
The input options ntmpi, ntomp and nt are related to number of mpi threads, number of openMP threads and total number of threads, respectively. The option deffnm produces output files with an extension of input file 1cta_nvt.tpr. The option nsteps controls the number of MD steps. Here, we choose small number of steps for simplicity, feel free to experiment with this number as you like. $ condor_submit gromacs_job.submit //Submit the condor job script "gromacs_job.submit"
After the simulation is completed, you will see the output files (including gro, cpt and trr files) from GROMACS in your work directory. This page was updated on Apr 23, 2019 at 11:45 from tutorials/tutorial-gromacs/README.md.